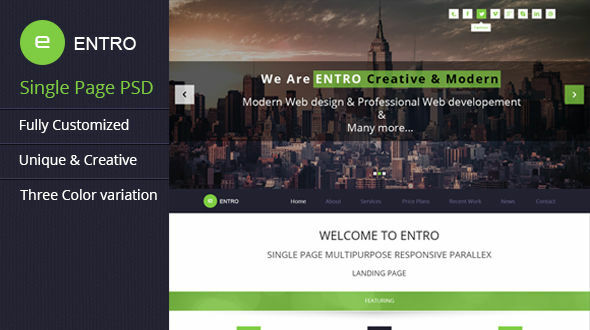 Entrois a Single Multipurpose, Clean & Creative PSD Template. Suitable for any type of business or personal use or else. PSD files are well organized and named accordingly so it’s very easy to change any and all of the design. Content area 1170 px wide. 3 PSD file available for downloads. These layered PSD files are compatible with Adobe CS3 and later. 3 Fully Layered Adobe Photoshop .PSD files. Well Organized layers make it very easy to update. Site content is 1170px wide. 3 index Pages with different color scheme. All shapes are vector elements and are 100% scalable and editable. All fonts used in the templates are available for download, the links are below.